With two big festivals I'm involved in — Creative Tourist's Manchester Weekender and The Manchester Literature Festival — right around the corner, I've been insanely busy and never seem to have the time to pootle around the city the way I used to. Yes, there's been a complete absence of pootling, not much pottering and certainly no meandering for as long as I can remember. But with the insane Indian Summer we had going on last Friday I gave myself an afternoon and evening for some good old fashioned moseying around Manchester. First I went to my favourite city centre park: St. John's Gardens. You know Piccadilly Gardens? It's pretty much the opposite of that. Clean, green and leafy, quiet — and in Friday's heat, kinda sleepy. I lay down on the grass listening to music and almost fell asleep. Then I went to The Book Barge. 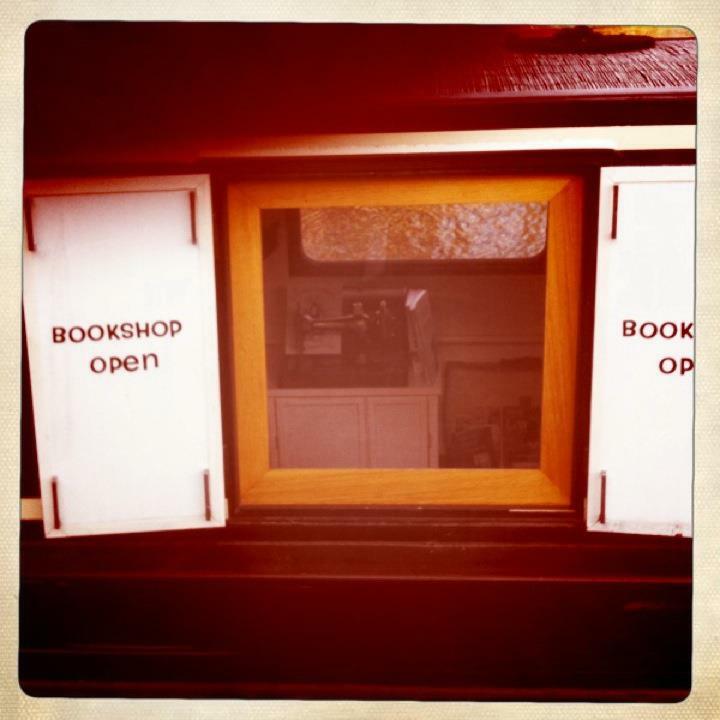 It's a floating bookshop shoehorned into a narrowboat that has been moored at Castle Quay for a few days. I was imagining a musty, dusty floating cabinet of curiosities. But it is nothing like that: clean and light, with a clever use of space and an immaculate stock of intelligently curated new books, serendipitous seconhand ones, a thoughfully-selected children's section and the sort of ephemera that book lovers drool over (Penguin tote bags, unjustly obscure magazines, bunting.) I ran into Adrian from The Art of Fiction. And I picked up a Puffin of Joan Aiken's The Whispering Mountain for £1. So I was happy. From Castlefield I walked over to the opening of Asia Triennial Manchester, one of the nicest launches I've been to in a long time. Had a good chat with artist NS Harsha about his Spiritual Garlands comissioned by the amazing John Rylands Library. 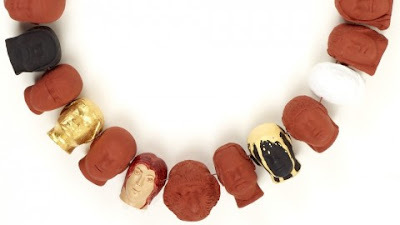 The garlands are intricate chains of individually-sculpted heads visitors to the library can wear around their necks, the chains emphasizing the way that ideas and knowledge pass from one person to another via books. I wished I could have gone on to Cornerhouse to see Rashid Rana but will have to save that for another time. Then some very important business. Namely, barbecue. Our city recently became home to two new barbecue joints and after hearing good things from a number of people I headed over to Southern Eleven at Spinningfields. My first impressions weren't great. Too many hard shiny surfaces, which in addition to seeming uncomfortably trendy also meant it was loud. But we were able to sit on the patio. The staff were absolutely wonderful — they really took care of us. And the other thing I want to emphasize about this place is it's an amazing deal: low prices and big portions. We didn't leave feeling like we'd just been mugged, as is so often the case when dining out in Manchester. I do love my barbecue, so I'm happy to report that the food was good. Pork belly ribs came with a brush-on pot of barbecue sauce and were nicely executed, though would have been better if a little more of the fat had been rendered on mine. Mac n' cheese was mighty fine. Onion rings and fries were both overseasoned; the first with chilli, the second with a superfluous combo of parmesan and truffle oil (and unfortunate that they were the pale, weedy kind instead of the skin-on, dark brown artisan variety that seem to be all the the rage in the USA these days.) Jalapeno cornbread tasted good but was a bit too fine and cakey in texture. And the Tennessee Rose cocktail I had was tall, pink, icy and flowery - just the drink for such a tropical evening. I forgot to take any pictures, but The Greedy Girl has just reviewed it as well and has some lovely pics on her site, so pop over there if looking at 'cue is what you wanna do.